Exploratio is the first ever survey of Roman military and civil intelligence. The authors examine in detail the operation and gradual development of Roman intelligence-gathering from shaky beginnings to a high level of excellence. They identify who gathered it, and for whom. This study shows the effects of intelligence on policy formation at various levels from the purely local through to the global. The consequences of various instances of the mishandling of information are uncovered. Austin and Rankov also demonstrate that intelligence gathering was not necessarily directed from Rome, but had for practical reasons to be carried out and processed on the frontiers themselves. 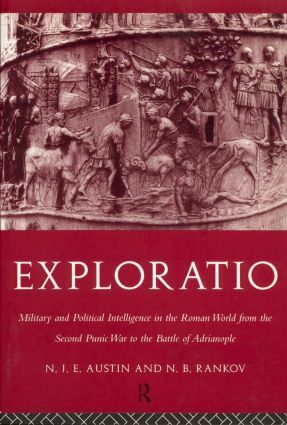 Exploratio is important reading for all students and teachers of Roman history. It will also appeal to those with a general interest in military or diplomatic history.